Conservationists across the world are saddened by the loss of the first pregnancy of Ratu, a young female Sumatran rhino at Indonesia’s Sumatran Rhino Sanctuary in Way Kambas National Park. Ratu and male Andalas, brought together through international goodwill and cooperation in an effort to save this critically endangered species, bred successfully in January, and a pregnancy was announced in February. Ratu, born in Indonesia, wandered into a village just outside Sumatra’s Way Kambas National Park in 2006. Andalas, the first of only three Sumatran rhinos born in captivity in more than 112 years, was born at the Cincinnati Zoo & Botanical Garden in 2001, grew up at the Los Angeles Zoo and was transferred from the L.A. 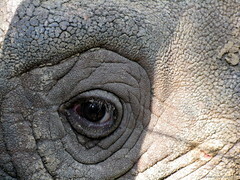 Zoo to the Sumatran Rhino Sanctuary in 2007. Three years after Andalas’ successful transition to the Sumatran Rhino Sanctuary, he and Ratu mated. The breeding followed months of gradual introduction by scent, sound, sight, and finally, physical proximity. An ultrasound revealed Ratu was pregnant in early February. However, recent examinations indicate that the embryo is no longer present. Baca selengkapnya di: WorldZooToday, March 31st, 2010.